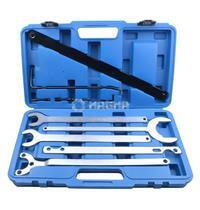 This set allows servicing of different areas of repair which require a specialty tool due to their confined locations. Allows removal of lock nuts on thermo viscous radiator fans found on Mercedes-Benz and Ford vehicles. Works on M111, OM604, OM605 and OM606 Mercedes-Benz engines from C and E classes with 36mm opening. This clutch Holding Tool allows the technician to hold the water pump pulley in place while loosening the radiator fan to allow removal and replacement of the visco-coupling on the cooling fan. Allows the water pump pulley to be held in place to permit the release of the fan. Also allows the water pump pulley to be held in place while the radiator fan is loosened. Holes at 38mm and 44.5mm permits work on BMW M10, M20, M30 and many other late model vehicles. Allows the removal and installation of the fan clutch assembly. The special slim shaft handle design permits easy work in tight areas. Works on Mercedes-Benz M103, M104, M119 and M120 with 65mm opening. BMW Fan Clutch Holding Tool allows the removal and installation of the thermo-viscous fan on BMW and Ford with 32mm opening.